The Faz Sun Bed / Chaise Longue is made in polyethylene resin and is suitable for indoor and outdoor use. Available in a range of different finishes. Finished with an RGB LED colour changes system that works via remote control. The Sen bed really creates a splash of colour during that day and especially at night. The Faz Sofa Corner unit 90 is part of the Faz modular safe range it is made of polyethylene resin by using a rotational moulding technique. 100% Recyclable. All the Faz range is suitable for indoor and outdoor use and available in a range of different finishes. Click Here to visit www.thecuedesignstore.co.uk and assemble the perfect modular sofa selection for your beautiful outdoor terrance or indoor atrium. 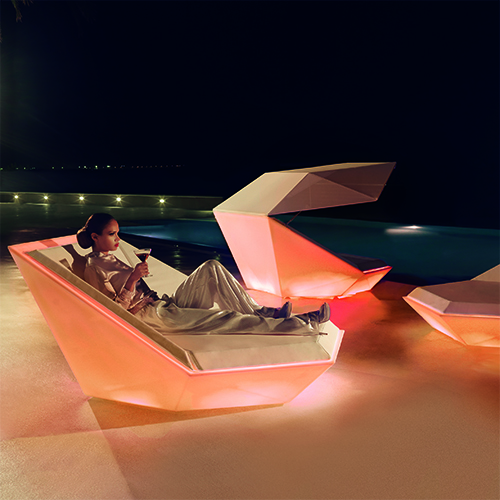 The Faz Daybed is made in polyethylene and is 100% Recyclable. The day bed adds a touch of class and style to any pool or beachside terrace, the Daybed is suitable for indoor and outdoor use and is available in a range of different finishes. Fitted with casters, rotary system 360º. Outdoor cushions (thick 4″). Finished RGB LED: Colour changes of remote control. Optional extras include: Pack Sound Bluetooth system 150W, Pack Battery + Charger and Pack 4 pillows 60×60 cm. The Faz Armchair is made in polyethylene resin using by rotational moulding technique for an outstanding finish quality. 100% Recyclable. The Faz is suitable for indoor and outdoor use and available in a range of different finishes. The chair can also come with RGB LED lighting, giving colour changes via remote control.